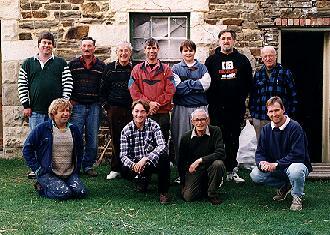 The New Zealand DX Radio Association regularly has its Annual General Meeting at the Shag Valley Station in East Otago. 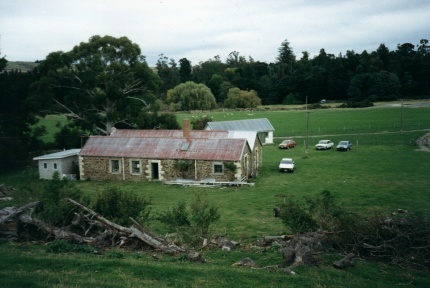 Shag Valley Station was also the site of the first ever radio transmission from New Zealand. Attendees: Back Row L-R: Mark Nicholls, Roger Pryde, Dave Nairn, Russell Dickson, Unid, Andy McQueen, Ron Killick. Front L-R: Ali MacArthur, Sean Pryde, Wally Singleton & Bruce Macdonald. 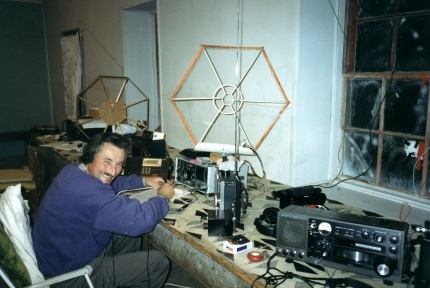 SHORT HISTORY OF NEW ZEALAND DX RADIO ASSOCIATION. 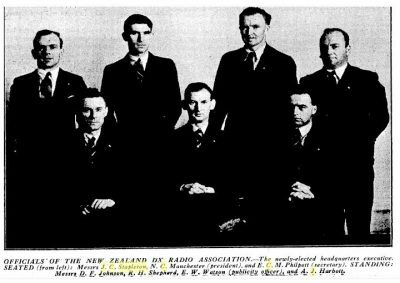 It all happened in January,1933,when 2 major Branches of the N.Z.DX Club met in a railway carriage in the Timaru yards and decided to form the N.Z.DX Radio Association. Nine members of the Dunedin and Christchurch Branches were the prime movers and through a commercially printed magazine, sold in the shops, interested people from all over New Zealand flocked to join. Branches were formed in various areas, where members could meet and exchange news of stations that were being heard. Originally, activities centred on the Medium wave band but support was forthcoming for news of the Shortwave bands. For some years, we had 4 Branches in Australia but with the formation of clubs over there, our branches ceased to exist. Headquarters was established in Christchurch and the magazine was printed in Dunedin. HQ shifted to Wellington in 1941 and 10 years later, to Auckland, In 1958, Dunedin became its home and that’s where it is at the present time. The magazine was originally a commercial printing, then went to duplication. It shifted to Wellington, where a change back to commercial took place but early in the war, it went back to duplication and has stayed that way since. The Taranaki and Christchurch Branches had their share of printing, then Dunedin but it now resides in Christchurch. Every Easter, the Annual General Meeting is held. It has been in many places but since 1987, Shag Valley has been its home. 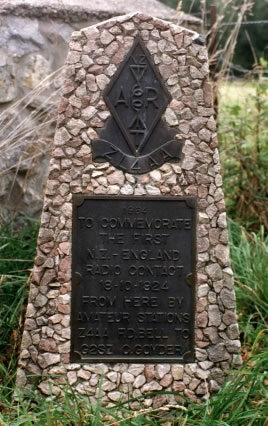 This location is that as used by a local amateur to make the first contact on the “Ham” bands with England. The premises are a historic shearing quarters, with good sleeping quarters and a roomy long room where up to 14 radios have been housed. In March 1933, the magazine “Tune In” printed call lists of medium wave stations throughout the world. Later, a booklet, called “Radio Calls of the World appeared, and eventually included Shortwave stations. This booklet was responsible for gaining many listeners as members. Although our overall membership number has reached over 3500, the number of financial members is less that 100. The advent of Television and the computer have taken a toll on new members joining. To the best of our knowledge, a member aged 84 years, is our oldest surviving member. He also holds a QSL from VLDN, the station that operated from the N.Z. and South Seas Exhibition in Dunedin in 1925-26. The name of this member is Harold Looker, RAI3. He was educated at Otago Boys High School and came under the eye of RA1, J.L. Anderson. North Otago Branch NZRDXL members visiting the NZDXRA… many belong to both Clubs. 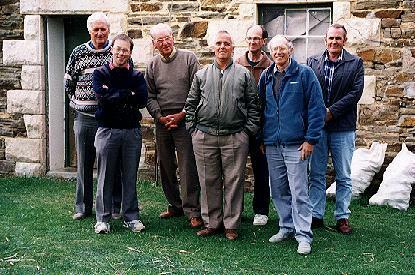 L-R: Alistair Sutherland, Paul Ormandy, Basil Jamieson, Ross Gibson, Keith Creighton, Peter Grenfell & Graham Stanaway. In the early 1960’s I was Secretary of the Melbourne (Aust.) branch of NZDXRA. I visited Dunedin in February 1963 and met some of the members of your branch and was amazed to hear US MW stations loud and clear – an impossibility in my experience in Australia. This Sunday, my wife and I begin travel on the Hamburg Sud line “Spirit of Melbourne” (container ship) from Melbourne to Philadelphia. We were to call at Pt Chalmers, but the ship is behind schedule and the captain has elected to by-pass the South Island, going direct instead to Tauranga & Auckland . I am please to know that your branch is still operating.